In November 2013 we did a 7 day Galapagos itineary B cruise. (Now Galapagos Inner Loop Itinerary). We looked at the different options and decided for a Celebrity Xpedition 10 day cruise tour with pre- and post-stay at JW Marriott in Quito and flight included to/from Galapagos. We did extend the stay in Quito with few days before and after the Xpedition cruise tour. We arranged our own flights from home to/from Quito. 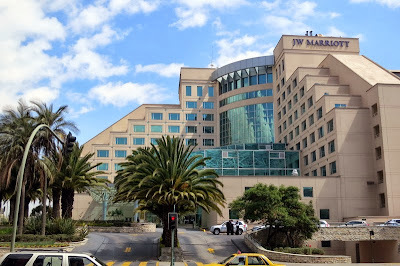 Read the review of the stay in Quito at the blog below where posts are in reverse order (latest first - still under development). JW Marriott hotel is located in Pradera area on Avenue Rio Amazonas. Close to shops, a market with local crafts as well as restaurants and shopping centers. The hotel is about 5 km north of the historic old part of Quito. The hotel has a total of 257 rooms spread over 11 floors. It features a heated pool, surrounded by palm trees and a spa and 5 restaurants.